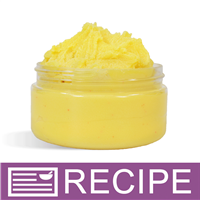 This sugar scrub has a beautiful natural golden color from the Tangerine Butter Blend that we accented with a hint of shimmer. 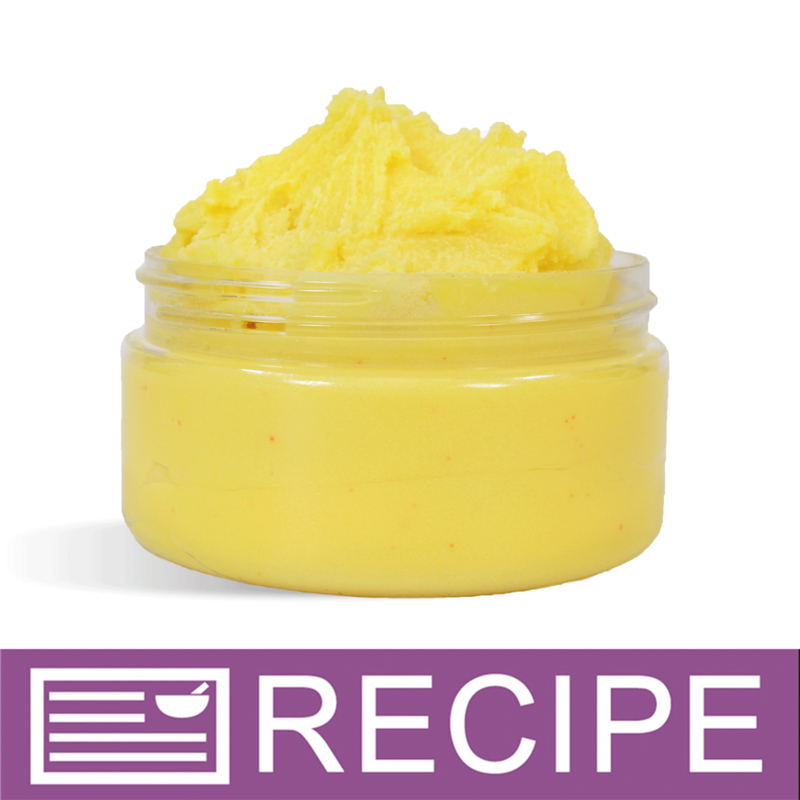 This is a perfect scrub for all-over exfoliating that will still leave you feeling moisturized! INCI Ingredient Label: Sucrose, Olive Oil, Sweet Almond Oil, Cetearyl Alcohol, Behentrimonium Methosulfathe, Stearic Acid, Cocoa Butter, Sweet Almond Oil, Tangerine Peel Oil, Hydrogenated Vegetable Oil, Fragrance, Phenoxyethanol, Methylparaben, Ethylparaben, Butylparaben, Propylparaben, Isobutylparaben, Vitamin E, Fluorphlogopite, Titanium Dioxide, Iron Oxide, Jojoba Wax, Red 6 Lake, Yellow 5 Lake. NOTE: If you are making these products for sale, good manufacturing practices recommend you wear a hairnet, gloves and a mask. We also recommend a clean apron. On a burner over low heat, or in a double boiler, heat the emulsifying wax, stearic acid, and butters until completely melted. Take pan off the heat and add oils, vitamin E, fragrance oil, mica and Phenonip. (Be sure temperature is between 140°-155ºF). Stir well. Place pan in refrigerator until the edges start to harden against the pan and a layer begins to form on top. Using a hand mixer, whisk mixture until it is creamy and opaque. Add sugar and jojoba beads and mix until completely blended. Fill each jar to 8 oz. by weight. Twist on lids. To Use: Massage gently onto wet skin. Rinse off with warm water. "Can Germall Plus be used in this recipe instead of Phenonip?" Staff Answer Yes, you can substitute the Phenonip with Germall Plus. "I have a question. I added .50oz of optiphen. Can I add the remining .15oz to final product and remix everything? thank you in advance "
Staff Answer The .50 oz. would actually be at .75% which is the minimum amount for this preservative. The previous amount was given at 1% for the preservative but this will also work. "Hello. Can I replace phenonip with optiphen? Keep same amount? Thanks"
Staff Answer If replacing with optiphen, we would recommend increasing amount to 0.65 oz. "hi, I would lie to know if I can substitute the cocoa butter for shea butter.. thank you"
Staff Answer Yes, you can made this substitution. "Hi I would like to know if I can substitute the cocoa butter with Shea butter. Thank you"
Staff Answer Yes, you can make this substitution.